A varied range of micro-climates, dominated by a mild organic. In Northern California, with wine country nearby, French, Italian, and Mediterranean inspired food is featured, as well as Asian-inspired fare. Many of the restaurants, cafes, bistro, and grills use of fresh, local ingredients is custom, sourced from local growers and farmers' markets. The California coast, especially the North Coast and Central Coast regions, is a source of seafood, which is a staple in the California diet. Battered and fried foods are not as common in California as they are in most other states, but there are several exceptions, such as fish tacos, tempura and french fries. The agricultural diversity of California's Central Valley provides fresh produce in the state. On less than 1 percent of the total farmland in the US, the Central Valley produces 8 percent of the nation's agricultural output by value. Sunset, a magazine of the West published in California, has featured recipes that have influenced the cuisine of California, including the promotion of outdoor eating. Southern California's legendary car culture and the population's reliance on automobiles for transportation throughout California's vast cities, has widely contributed to the popularity of the classic drive-in and modern drive-thru restaurants. Restaurant chains such as McDonald's, Jack in the Box, In-N-Out Burger, Carl's Jr., Wienerschnitzel, Del Taco, Taco Bell, Panda Express, Original Tommy's, Fatburger and Big Boy were all established in Southern California . 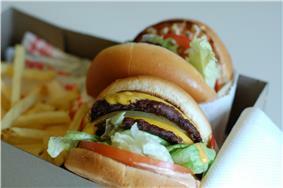 Regional fast food menus differ, generally depending on the ethnic composition of an area. In Southern California, smaller chains like The Hat feature hamburgers, Mexican food, chili fries, and pastrami. While gastropubs are not unique in California, the concept of the gourmet burger is very popular. Because of California's colonial Spanish roots, Mexican territorial history, and its original population consisting of Meso-Americans, Spanish colonizers and Mexican ranchers, Mexican and Spanish-origin cuisine is very influential and popular in California, particularly Southern California. 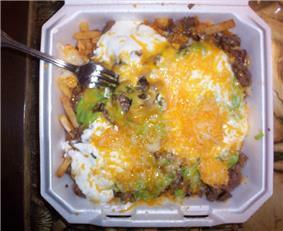 Commercial, quick "taco shop-style" Mexican fast-food, consisting of offerings such as burritos, refried beans, tortas, tacos, nachos, quesadillas and carne asada fries is widely popular. Countless Taco shops can be found throughout California. 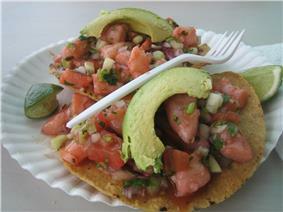 Traditional Mexican food, while not as common as commercial food, is still widely prepared and abundant in the ethnic Mexican American border communities of San Diego, the Los Angeles metropolitan area, the San Francisco Bay Area, and in Mexican-American enclaves throughout California. Examples of these foods include tamales, tortillas, tostadas, mole, menudo, pozole, sopes, chile relleno and enchiladas. In addition to Mexican food, California restaurants serve up nearly every other variation of Central American food there is. For example, pupuserías are common in areas with a large population of Salvadorans (pupusas are stuffed tortillas from El Salvador). More recently, "Fresh Mex" or "Baja-style" Mexican food, which places an emphasis on fresh ingredients and sometimes seafood, inspired by Baja California fare, is highly popular. El Pollo Loco, a fast food chain that originated in Northern Mexico, is a common sight. Rubio's Fresh Mexican Grill, Baja Fresh, Wahoo's Fish Taco, Chronic Tacos, Chipotle, Qdoba and La Salsa are examples of the Baja-style Mexican American food trend. 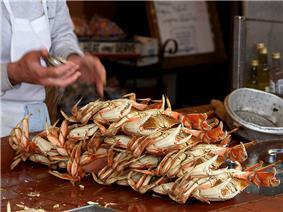 In Northern California and the Central Coastal region, Dungeness crabs and salmon are abundant. As one of the U.S. states nearest Asia and Oceania, and with long-standing Asian American and Oceanian American populations, the state tends to adopt foods from those national styles. The American sushi craze no doubt began in California; the term 'California roll' is used to describe sushi with avocado as a primary ingredient. These days, items like mochi ice cream and boba are popular. Fusion cuisine is quite popular in California. The emphasis of California Cuisine is on the use of fresh, local ingredients which are often acquired daily at farmers markets. Menus are changed to accommodate the availability of ingredients in season. Some restaurants create a new menu daily. California chef Wolfgang Puck is known as one of the pioneers of fusion cuisine, popularizing such dishes as Chinese chicken salad at the restaurant Ma Maison in Los Angeles. His restaurant "Chinois" in Santa Monica was named after the term attributed to Richard Wing, who in the 1960s combined French and Chinese cooking at the former Imperial Dynasty restaurant in Hanford, California. 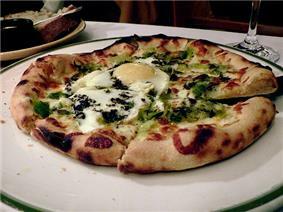 California-style pizza focuses on non-traditional pizza ingredients, such as fresh produce and barbecued meats. First popularized by Wolfgang Puck's Spago restaurants, it was later brought to the masses by restaurants such as California Pizza Kitchen. Barbecue has been a part of California cuisine since the Mexicans cooked beef in pit barbecues on ranches in the 1840s. Santa Maria is famous for the Tri-tip, a special kind of beef cut that can be grilled, baked, braised, or roasted. California's barbecue style is also influenced by the regional Southwestern American styles of Arizona, New Mexico, Texas, and Oklahoma, brought on by thousands of Dust-Bowl migrants. Chicken, beef ribs, sausages, and steaks are also routinely grilled or smoked in a pit. The barbecue sauce used in this state is tomato-based, as with all other western states. Santa Maria barbecue, however, uses no sauce, relying instead on the flavor of the tri-tip and the slow live oak fire over which it is cooked. Pork baby back ribs are popular for barbecue in the Western region in comparison to the popular use of spare ribs in the Southern United States. Many gourmet food products and companies had their start in California, including Peet's Coffee & Tea, one of the first purveyors of arabica coffee beans in the United States. ^ Vileisis, Ann. Kitchen literacy: how we lost knowledge of where food comes from and why we need to get it back. ^ Weir, Joanne. Wine Country Cooking. ^ Khokha, Sasha (2005-07-15). "In Rural California, an Imperial Dynasty Ends".